I’ve previously written an article on how to build strength, but what if you’re more interested in bulking up and building bigger muscles? Read on to maximise your muscle gains! If you’re looking to gain muscle size, you must eat in a calorie surplus – eat more than you burn. Eat anywhere between 200 and 500 extra calories a day; the more you eat, the more you’ll gain. However, you’re also likely to put on more fat in the process, so try not to eat too many extra calories. Calorie counting is the best way to do this, whilst it can be a bit time consuming, there are now good apps such as MyFitnessPal that will make the process a little easier. You need to perform enough reps to cause some muscular damage, rather than just training the nervous system. This means that you need to do higher reps. However, if you perform too many, then the exercise you’re performing is not challenging enough and will likely improve your endurance instead. Aim for 8 to 12 reps. If you do just the one set, this won’t be enough to initiate hypertrophy; too many and you’ll start to lose form and have to make the exercise easier. 2 to 4 sets of the same exercise is the optimal amount for building muscle. You want to ensure that your muscles are not recovering too much between sets. Too little rest and you’ll start to build endurance, too much and they will recover too much. Rest for periods of 1 to 2 minutes. Unlike building strength where we want to avoid muscle failure, reaching muscle failure is an essential component to building bigger muscles. If you complete all sets and reps without reaching failure, then you must progress the exercise and make it more difficult next time. Sleep is when your testosterone is recharged; it’s also when our muscles repair and grow bigger. If you’re not getting enough sleep, then you’re not going to get the most out of your training. 8 hours sleep is the number we should all be aiming for, this can be topped up with naps when possible. Creatine is one of the most studied supplements and has been demonstrated to not only increase your strength output, but also to improve muscle-mass. With very few side-effects, it’s one of the few supplements that I take. As always consult your Dr before commencing a new supplement to ensure you have no allergies. Whilst this one is easier said than done, it is a very important part of building muscle. When we get stressed, we release the hormone cortisol – often referred to as the stress hormone. Cortisol reduces your testosterone levels, which will reduce your muscle gains. As your muscles grow they will get tighter; this can lead to injury or impede on your ability to perform movements that require good range of motion. Be sure to stretch all the muscles that you are working. Stretching has also been demonstrated to reduce cortisol levels. 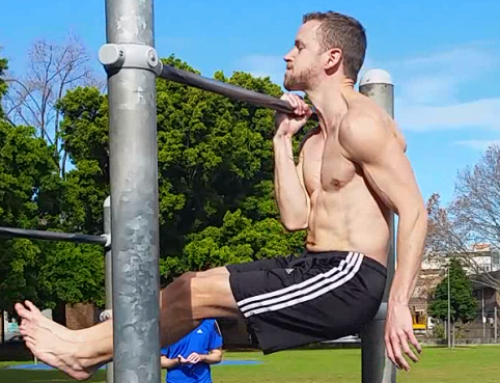 Calisthenics is known for some very high level feats of strength, but you’re not going to build any muscle by holding a human flag for 10 seconds! I suggest whilst your focus is on building muscle, to put your skill moves to one side. Reps and sets with enough time under tension are the proven way of building muscle. To do this you need to focus on the calisthenics fundamentals movement patterns. Mind-muscle technique is the act of using your mind to increase muscle activation during a movement. Studies have shown this method to improve muscle activation, which in turn will increase your muscle growth. Start by doing some basic activation exercises before your main movements. Then during each exercise focus on activating the prime movers of the movement. 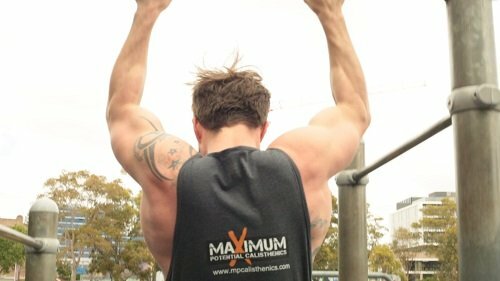 For example, if you’re performing a pull-up, do some scapula pull-ups beforehand to activate; then during the pull-up focus your mind on activating the lats. Dehydrating you which makes it harder for your muscles to retain water. Limiting your testosterone growth and actually increases your estrogen levels. That doesn’t mean you shouldn’t drink (unless training is your life), but you may want to consider cutting back a little during a bulk.